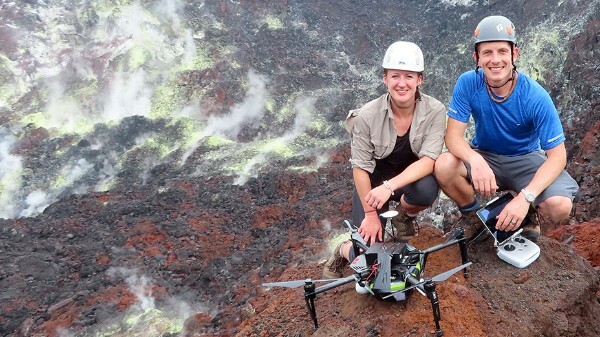 Emma Liu (left; University of Cambridge, UK) and Kieran Wood (University of Bristol, UK) with a multi-rotor drone on Rabaul Volcano. Liu, Wood, and colleagues are currently in Papua New Guinea as part of the newly funded DCO project “Aerial Observations of Volcanic Emissions from Unmanned Aerial Systems.” Image courtesy of Emma Liu. Follow the team’s progress here. Deep life and methane dominate this month’s DCO news. A new paper about IODP Expedition 357: Atlantis Massif Serpentinization and Life, led by Gretchen Früh-Green (ETH Zurich, Switzerland) and Beth Orcutt (Bigelow Laboratory for Ocean Sciences, USA), documents magmatic, tectonic, and alteration processes of an oceanic core complex that is actively undergoing serpentinization and has the potential to sustain a unique subsurface biosphere. By studying a mud volcano on the seafloor north of Norway, Emil Ruff (University of Calgary, Canada), Antje Boetius (Max Planck Institute for Marine Microbiology, Germany), and colleagues investigated the formation of a “microbial methane filter," a layer of cells that efficiently consumes methane escaping from sediments before it reaches the water column and reduces greenhouse gas emissions from the seafloor. A comprehensive analysis of a global dataset of 20621 samples of natural gas by Giuseppe Etiope (INGV, Italy) and Alexei Milkov (Colorado School of Mines, USA) appears in Organic Geochemistry. The researchers updated genetic diagrams that are commonly used to interpret the origins of hydrocarbon gases. In addition to these empirical diagrams, DCO is developing novel approaches for determining the origins of natural gas based on methane clumped isotopes. Also in the news this month, Edward Young (UCLA, USA) is featured in a recent episode of the Science Channel’s documentary series “Space’s Deepest Secrets.” The episode, “Dark Origins of the Moon,” demonstrates how data from the Panorama mass spectrometer place new constraints on the formation of Earth’s moon. On the programmatic side, DCO is delighted to announce three grants awarded by the Alfred P. Sloan Foundation to support DCO activities through the end of the decadal program on 31 December 2019. DCO is immensely grateful for the Sloan Foundation’s generous support of deep carbon science since 2009. And as November approaches, please consider the following opportunities: 1 November 2018 is the deadline for submitting session proposals to Goldschmidt 2019, which will take place in Barcelona, Spain from 18-23 August 2019; 7 November 2018 is the deadline for early career scientists to apply for a DCO bursary to support their participation in the Volcanic and Magmatic Studies Group Meeting in St Andrews from 8-10 January 2019. Finally, I would like to call your attention to intrepid DCO scientists who have been conducting exciting expeditions around the world, including Discovering the Carpathian Volcanism, a Deep-Sea Oceanographic Expedition to the Lost City Hydrothermal Field, and Expedition Papua New Guinea. The American Geophysical Union’s Fall Meeting is the largest Earth and space science meeting in the world. This day-by-day guide lists sessions involving DCO scientists and others of potential topical interest to DCO attendees. The purpose of this symposium is to break down the barriers between scientists, policy makers, industry leaders and business entrepreneurs to collectively generate a deeper understanding of our planet’s natural resources.